Caution: The behaviors he explores don’t explain the major problems organizations encounter. This caution doesn’t mean that this book isn’t a valuable career “brainroad”©. The corporate world is filled with executives, men and women who have worked hard for years to reach the upper levels of management. They’re intelligent, skilled, and even charismatic. But only a handful of them will ever reach the pinnacle—and as executive coach Marshall Goldsmith shows in this book, subtle nuances make all the difference. These are small “transactional flaws” performed by one person against another (as simple as not saying thank you enough), which lead to negative perceptions that can hold any executive back. 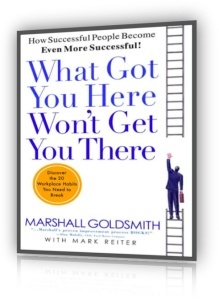 Using Goldsmith’s straightforward, jargon-free advice, it’s amazingly easy behavior to change. Executives who hire Goldsmith for one-on-one coaching pay $250,000 for the privilege. With this book, his help is available for 1/10,000th of the price.